Hillsboro Safety & Service Director Mel McKenzie spoke before county commissioners at their Monday morning meeting. Warner told The Times-Gazette that his department has been operating at a loss for the past five years and that passage of the replacement levy would bring funding up to present-day levels. 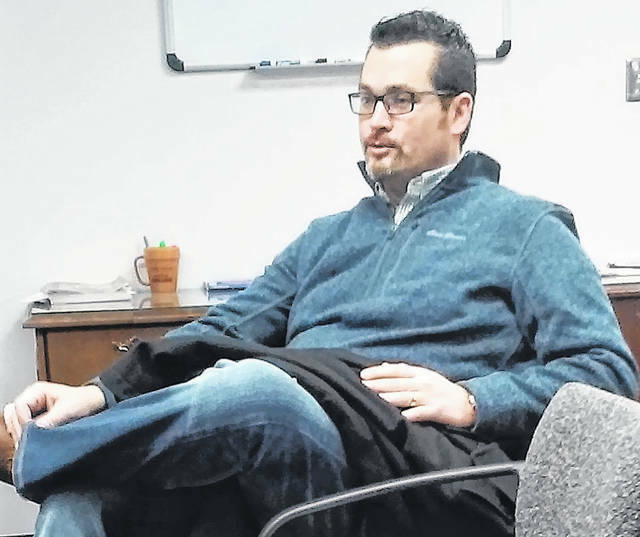 He said it would cost the average property owner about 79 cents extra a month, based on a valuation of $100,000, which still remains the smallest tax levy in Highland County. Also Monday, Highland County Sheriff Donnie Barrera discussed with commissioners the issue of employees in his department seeking to opt out of the county’s health insurance plan. He said that under the current contract, employees have the right of opting out with an incentive program that will pay them to do so. Employees who prefer to be insured under a private plan or a spouse’s insurance policy will receive $1,500 to opt out of single coverage or $2,000 for family coverage, contingent on when their employment with the sheriff’s office began in addition to a 13-month waiting period to receive the reimbursement. Barrera said the issue facing his office has to do with tracking start dates, and determining eligibility status in order to receive the reimbursement. “It’s an issue of coming up with a more streamlined approach that identifies when each employee is eligible to receive the reimbursement,” Commissioner Gary Abernathy said. He said that currently there are seven employees who want to opt out of the family plan. Hillsboro Safety and Service Director Mel McKenzie gave a briefing on projects both completed and underway in the city, telling commissioners the biggest thing his office is working on at present is a “principle forgiveness” grant from the U.S. EPA to address the problem of storm water drainage in the city. The $1 million dollar grant is earmarked for a sewer trunk line replacement on Vaughn Avenue, and for the first phase of the storm sewer project. In other matters, Clint Davis from the Highland County Community Action Organization briefed commissioners on the agency’s solid waste recycling programs for the upcoming year, confirming that Saturday, June 8 had been scheduled for the tire and electronics recycling effort, which will be in the HCCAO parking lot at 1575 N. High St., Hillsboro. He also asked commissioners to approve $500 in matching funds for a $2,500 grant from the Environmental Protection Agency, similar to the Recycle Ohio Grant the local agency has received in recent years for the purchase of litter clean-up supplies and advertising. If a civic or social service group or organization wishes to help in litter pick-up and recycling, he said his office can be contacted at 937-393-3458 or online at hccao.org/recycle. Commissioners had one contract on the agenda Monday morning, giving their approval to an agreement between Highland and Jackson counties to house prisoners during the current fiscal year.